Considering Kissinger used to brag about chasing away Arab diplomats with UN 242 the fact that 2 of the 3 concessions were won from Israel is a hopeful sign. It is natural gas, not oil. There are no significant oils finds – at least not yet. But big natural gas finds. It isn’t certain a pipe will be laid to Turkey. Lots of problems even with this normalization. 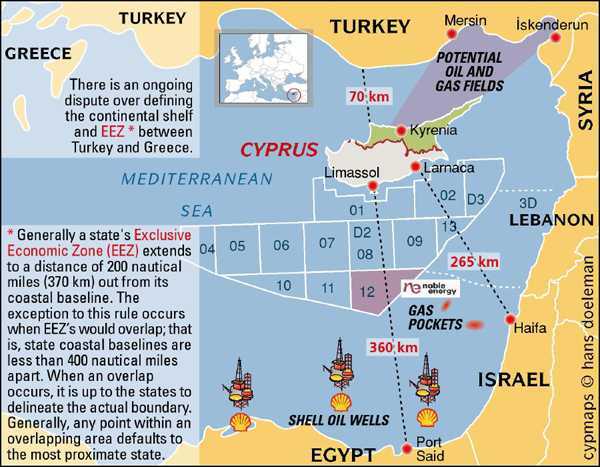 One major problem is that the pipe will have to run in Lebanese or Syrian waters or alternatively via partitioned Cyprus (a whole can of worms, particularly since Cyprus is an EU member). My bet is that Turkey is more interested in arm deals and maintenance – more that the gas. Oh, and BTW, it’s Turkey that buys and consumes ISIS oil, not Israel. @ lepxii: About Abbas, what did you expect? He’s an idiot. If as many Palestinian officials read my blog as Israeli officials do, he could’ve avoided this stupidity. @ Abby: That’s Globes, Israel’s leading business publication that you’re calling “rubbish.” I’d say given a choice between Globes & you, I’ll take Globes any day of the week. And as for which of these sources is “rubbish,” I think that’d be you. Globes does not publish it as a confirmed fact but as a report by “al-Araby al-Jadeed.” Huge difference!! Would you take the word of “al-Araby al-Jadeed” over something else any day of the week? a. The same OECD report you mention actually recommends immediately implementing the gas plan. b.	Israel is not the poorest OECD country. It has the highest level of poverty which is something altogether different. Poverty has no objective definition. It is arbitrarily defined as earning half the average national income not including indirect government support. Comparing poverty in Mexico and Israel is just plain wrong. c.	Half of poor families are either Haredi or arab-muslim with low work participation of men or woman or both. The reasons are more cultural/religious, not the result of discrimination. When you raise a large family and have limited working skills it obviously will be more difficult for you to reach the median income. This is especially true of the Bedouin population in which polygamy is common and girls are encouraged not to acquire higher education. d.	Never the less there is plenty of good in Israeli economy compared to OECD: low unemployment (5.9% vs. 7.3) especially among young (10% vs. 15); high health level (average life span of 82.1 vs. 80.5; higher than average satisfaction level; relatively lower tax burden; less public debt. Aren’t between 12.5% to 20% of the profits generated by these gas fields taxable by the Israeli government? Any way you look at it, it’s a significant windfall for the average Israeli. Also, a significant percentage (I read 53%) is reserved for domestic consumption meaning energy prices are going down. Already several coal burning electric plants are being converted to run on soon to be abundant and cheap natural gas – meaning the price of electricity is also going to drop. Sure, some consultants and business interests are going to do quite well, but one can’t say that none of the benefits will make there way to the average Israeli. What am I missing here? The Turks might hope to get part in the construction of future seaport/airport island nonsense suggested by Israel. That must worth billions in contracts. This isn’t a Globes investigation but a report about an article on al-Araby al-Jadeed https://www.alaraby.co.uk/english/features/2015/11/26/raqqas-rockefellers-how-islamic-state-oil-flows-to-israel . That article by itself is a joke based on some mysterious officials and colonels. Richard, if you saw through the well-poisoning hoax, why can’t you see through this one? @ Eran: Here’s how a quality media publication works: they research their story and include credible media sources in their own report. A good media outlet doesn’t include fake or ridiculous sources because that would cause it to lose credibility. THat means that Globes, being a quality media outlet, didn’t quote a source it didn’t trust. So I trust Globes & I trust the story. So if you actually have real evidence to disprove the claim in the Globes report, offer it. If you don’t, take a hike. The fact that Al Araby quotes Islamist sources acknowledging it did sell oil to Israel proves Globes point & my point. It doesn’t as you claim, support your own. @ eli: Claiming “poverty has no objective definition” is a ridiculous claim. When you use an agreed standard to measure poverty throughout your report and apply it to all countries included in the survey, that’s by definition objective and not arbitrary. And I do enjoy your squirming to try to say that Israel having the highest level of poverty among OECD countries is somehow less alarming than being the poorest country in OECD. If I hear one more pro-Israel apologist like you try to blame the Israeli poor for their own poverty I will scream. Repeat after me: if there are massive numbers of poor in a country the rulers of the country are responsible. The poor are victims. They don’t cause their own poverty. So if Haredim and Palestinians are poor, it is the fault of Israeli society for not offering them to tools to escape poverty. And yes, institutional racism and discrimination is largely at fault for this, especially for Palestinians. If Israel does not acculturate Haredim and permits them to live in their own religious/educational ghettos that’s Israel’s fault. There are ways to draw religious minorities into the body politic. Israel refuses to do anything to address this problem. It permits Haredi schools to let students graduating knowing barely more than 2+2. That’s shameful. The U.S. had a War on Poverty in the 1960s. Israel has a war on the poor run by Milton Friedman’s favorite Israeli, Bibi Netanyahu. You withdrew the social safety net and Israelis became poor. That’s what happened. Not that the poor chose to be poor. I find this statement deeply offensive. So don’t make it again. @ Abby: Israel bought Iranian oil violating the sanctions regime. Now it buys ISIS oil. And Kurdish oil may just as easily be ISIS oil as Kurdish. Kurds are buying & selling ISIS oil. @ pea: Where will these new tax revenues go? To end poverty? To integrate Palestinian citizens into Israeli society? No. They’ll go into the maw of the military machine. Or fund an MFA program to defeat delegitimization. As for where prices will go, don’t be so sure. Scores of countries have eagerly anticipated the wealth that would pour on their citizens and the free gas they would enjoy only to be supremely disappointed. In fact, natural resource “finds” like this often exacerbate social inequities because the wealthy ensure that they become wealthier. Their greed isn’t clever enough to understand that if they deny any benefit to the poor, they will eventually rise up against them. Israeli oligarchs are no different. You call yourself a journalist and you don’t know the difference??? You really have no idea? Do you? Though we hopped on unexpectedly quickly to another subject I would like to dwell a bit more on the topic of that important Turkish-Israeli deal. @ Eran: Read the comment rules carefully before publishing another comment. Do NOT repeat yourself in multiple comments. Also, keep your comments to no more than three per 24 hour period. And if you continue insulting me you’ll end up in the dustbin of commenter history here. If ISIS sells oil and it ends up in Israel I don’t care how it got there. It means that Israel bought ISIS produced oil. There are easy ways to oversee the purchase of oil. Israel could detect the origins of the oil it buys if it wished. But it doesn’t wish. Hypocrisy. And you’re defending hypocrisy. You mean if we have ping-pong conversation, I should not answer you if it is more than 3 times a day? Or if i’m involved in another thread? Seems like a way to shoot up readers you dislike. All the report has is he said/she said with no concrete evidence. Globes doesn’t publishes as a fact but as a report published somewhere. It isn’t a courtesy of crediting al-Araby al-Jadeed with breaking the story but rather saying, they have said that. Period! The whole story here is about national interests trumping ideology. Israel and Turkey need each other, end of story. There’s no love affair. I know that for many of you ideology is all about self-righteous moral judgements, but the system of international relations has never worked that way and never will. Countries than repeatedly let ideology supercede interests fail. Get over it! BTW, the supposed opponents of the deal in the Israeli Cabinet (Lieberman+Bennett) only allow themselves to oppose it because they know the decision does not hinge on them, and they prefer to pander to local populist political interests to gain votes. Same with Herzog from Labor– the political motivation of his cynical statements opposing the deal is so transparent its a joke, and even his own party contradicts him. @Eran: Let’s have a reality check you heartless jackass. First, 46 million Americans live in poverty, less than 15% of overall population. 25% of Israelis live in poverty and 33% of Israeli children live in poverty. At least the U.S. has a safety net, unlike you lot in Israel who abandoned it. Saying people are poor due to “cultural differences” is racist, condescending & just plain wrong. People are poor when society abandons them, as your society has. Claiming Israel can’t take action to fight poverty because of political correctness is insulting, false & offensive. I find your attitude to be disgusting & will not shirk from moderating or banning you if you persist in such racist demagoguery. Except that it cannot by any stretch of the imagination deemed to be in either Turkey’s or Israel’s national interest for these Turkish projects in Gaza to be destroyed as Israel has destroyed so many others. So let’s hope that Hamas or other smaller extremist groups do not use Gaza as a staging platform for attacking Israel and provoke an attack on Gaza which endangers these projects. Perhaps Turkey can act as a moderating force on Hamas. What scores of countries? Also the tax revenues are going to be massive – there’s no way to limit their use to just anti-delegitimization programs or military expenditures, especially in an era where the military is in belt tightening mode and thousands of career officers are being let go. There is going to be a big financial windfall. The government knows it, the people know it, and the government knows that the people know it. I pity the cabinet that decides to squander this money to their own personal benefit. Sure, they do that now, but being so blatant about it would be political suicide. Already public pressure has forced the government to renegotiate the pre-existing and pre-approved deals with the energy companies. The Israeli people are demanding their share of the windfall and there is no indication, at least none that I have observed living in Israel, that the pols and the chazers are going to be able to grab the lion’s share of the tax revenues for themselves. What Hamas does or doesn’t do is pretty irrelevant as far as the Israeli political establishment’s need for solidarity cementing aggression is concerned. In your defence of Israeli levels of poverty and inequality, you could also have pointed out that Israel has a powerful and very influential “Occupy” movement, which is something that the likes of Mexico entirely lack.